Universalism shows two faces to the world: an emancipatory face that looks to the inclusion of the other, and a repressive face that sees in the other a failure to pass some fundamental test of humanity. Universalism can be used to demand that we treat all persons as human beings regardless of their differences, but it can also be used to represent whole categories of people as inhuman, not yet human or even enemies of humanity. The Jewish experience offers an equivocal test case. Universalism has stimulated the struggle for Jewish emancipation, but it has also helped to develop the idea that there is something peculiarly harmful to humanity about Jews - that there is a 'Jewish question' that needs to be 'solved'. This original and stimulating book traces struggles within the Enlightenment, Marxism, critical theory and the contemporary left, seeking to rescue universalism from its repressive, antisemitic undertones. 'Fine and Spencer are excellent in showing how universalism both offered a progressive pathway to emancipate Jews and a means to suppress their particularity. They meticulously probe the conundrum of whether, in Enlightenment thought and practice, Jews could only be humans and never Jews.' 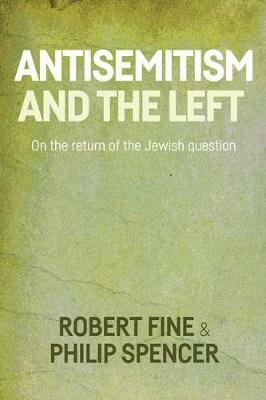 Robin Cohen, University of Oxford 'Fine and Spencer have contributed some very sensitive, and sensible, analyses of attitudes towards antisemitism and the Jewish question from universalist thinkers, beginning with the Enlightenment and going on through to current debates on the left about Israel.' Steven Beller, Independent scholar, Washington D.C., Patterns of prejudice, 2017, Vol. 51, No. 5 -- .